The philosopher David Hume (1711-1776) has had a profound effect on critical thinking, modern psychology, and politics. While many philosophers are relegated to fame solely in the classroom, Hume’s impact is also reflected in popular culture. A great many works of literature and film would not have been able to develop their themes without the influence of this philosopher. 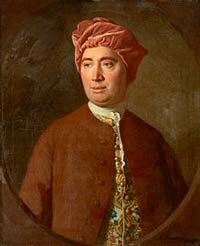 The Scottish philosopher David Hume was born in Edinburgh in 1711. He was originally born with the name Home, but changed it because Hume was the more common means in which the name was pronounced in other areas of the United Kingdom. Hume spent the bulk of his life living in his family home as he never married. At the age of 12, Hume enrolled in the University of Edinburgh where he studied philosophy after originally dabbling somewhat in law. Hume ended up becoming more self-taught during his tenure at the university since he had disdain for the professors. Hume would enthrall himself in reading the classics and this would become his pursuit over the course of his life. As a young man, Hume started work at a merchant’s shop, which did not last long. He would invest four years writing a work that he would complete at the age of 26. The work would be The Treatise of Human Nature and it became one of the most seminal works of philosophy and psychology. It dealt with reasoning and moral subjects, but it was lambasted by critics when first released. Hume dismissed the critics and put his effort into his next work, Essays Moral and Political, in 1744. He would go on to great acclaim with the six-volume series, The History of England. This work was published over the course of several years starting in 1754 and ending in 1762. He then became involved with the theater and became a critical thinker in the Scottish Enlightenment movement. Out of this movement emerged his work, An Enquiry Concerning Human Understanding, which was revolutionary at the time. For the ideas posited in it, Hume was charged with heresy, but he avoided a conviction because he was an atheist. As such, the church had no jurisdiction over him. Hume’s career did suffer, however, and he was denied a chair at the university. Hume did not experience much commercial success with his writings until the release of Political Discourses. In his later years, he made a living working as a clerk, although this job ended on sour terms. Hume tried to bridge science and reason. In particular, Hume wanted to prove that desire, as opposed to reason, is what motivates most people. Hume was also a major proponent of skepticism and, since he was an atheist, he did not promote a belief in a creator. Hume died peacefully at the age of 65 in his home country of Scotland.